The head is foxy, with a fairly broad skull, which is flat between the ears and has a moderate "stop" at eye level. The muzzle is tapered; the nose is black. The eyes are well set, hazel, or blending with the coat color. The ears are pricked, rounded at the tip, and of medium size. While a scissors bite is preferred, a level bite is acceptable. The neck is fairly long, the forelegs are short and straight, and curve slightly inward around the broad, deep chest. The body is of medium length, not short coupled, and the topline is level. The hindquarters are moderately angulated, and straight when viewed from behind. The feet are oval. The standard calls for a dog to be 10-12 inches at the shoulder and weighing 25-30 lbs. The coat is dense and medium in length. There are several acceptable coat colors: various shades of red with white markings on the feet, neck and chest, sable coloring (black hairs interspersed with red), tri-coloring (black and tan with white markings), and black and tans. 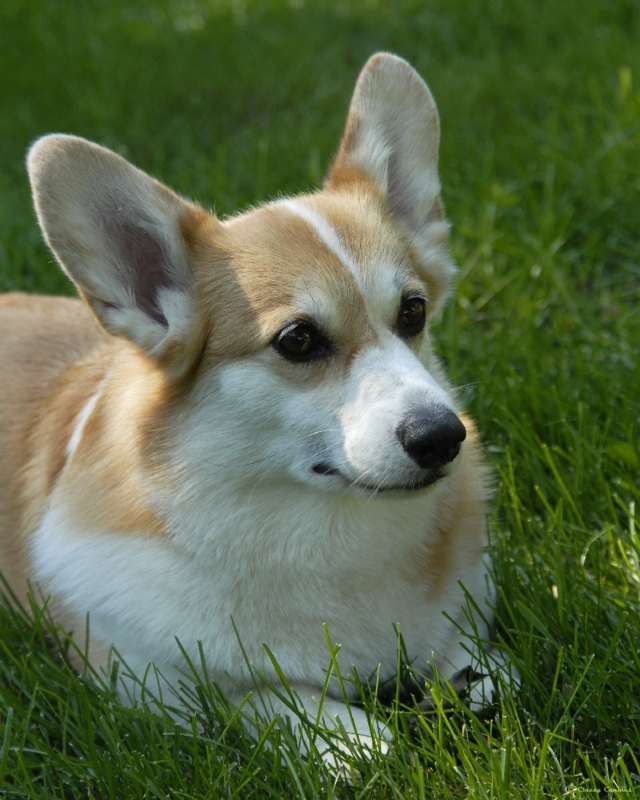 There are some well-bred Corgis who have "very serious faults" according to the breed's A.K.C. Standard of Perfection. Some of the faults are: ears that do not stand erect (as an adult); white markings on the back between the withers and tail, on the sides between elbows and back of hindquarters or on the feathering; an overshot or undershot bite; undescended testicles in a male; oversized or undersized as outlined in the standard. Conscientious breeders DO NOT allow these puppies to be registered with the A.K.C. until after they are neutered. A CONTRACT TO THAT EFFECT SHOULD BE SIGNED BY BOTH THE BREEDER AND PURCHASER. These dogs should not be bred.